It’s not often that you see high-end cameras come in anything besides black. The old adage: “You can have any color, as long as it’s black…” would be fitting. 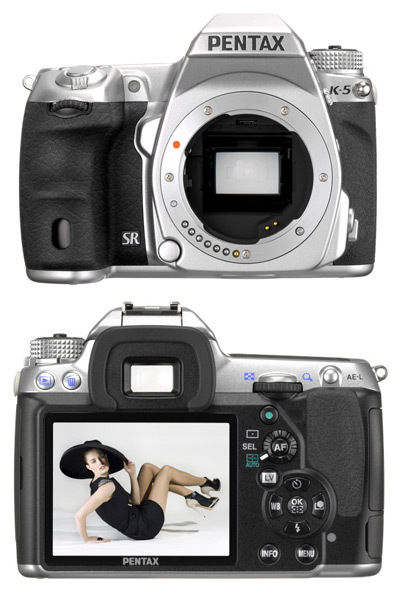 On the other hand, Pentax has continually released a limited edition of each high-end camera body in silver. The main issue is that the quantity is only around 1000 and they are only officially sold in Japan. Some time last year I had seen a single K-7 Silver on Ebay, but I just couldn’t justify the price premium and having to buy from a 3rd party to get the camera. Lately, there have been rumors that the K-5 will also be coming out in a silver version. Just a few days ago some pictures were leaked from Pentax Europe’s website. What I find odd so far is that the K-5 has only been available for around 4 months, which seems too early for a special edition camera body to be released. Maybe it means Pentax took a hint that the global market might be interested in a higher level body that isn’t just black. Assuming the picture is genuine, we see that this silver version is quite a bit different than the K-7 was (google it for pictures). Especially the grip as it has a new shape, which is intriguing. So the question is to Pentax, will you keep this gem for 1000 people in Japan, or will you release it alongside the black K-5 for everyone to enjoy? This entry was posted in News and tagged k-5, limited, rumor, silver, special. Bookmark the permalink.